A tasty twist on the classic showing the versatility of Rum. The Sidecar is a great example of a classic cocktail that is built with just three ingredients. Every element serves a purpose and every ingredient has to be good as there is nowhere to hide. We have tweaked this classic, as many bartenders have through the years, to feature the rich and complex flavors of Aged Rum in place of the traditional Cognac. 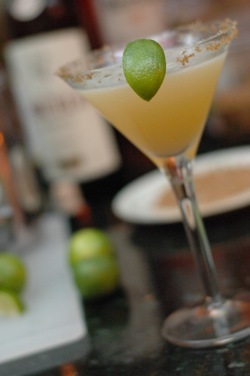 We have also substituted the limes for lemons as Rum and lime have a long-standing love affair. In a cocktail shaker add the Rum, orange liqueur, and lime juice. Top with cubed ice and shake vigorously for 10 seconds. Strain into a chilled cocktail glass that is rimmed with raw sugar (optional). To rim the glass with the sugar wet the rim with a lime wedge. Dip the wet rim into a bowl or plate of raw sugar to give a modest coat of sugar.